Prevolv believes a well-designed work environment leads to happy employees and a productive and profitable business. As a cohesive team, they partner with their customers to clarify their desires, develop innovative solutions and offer quality products and services to enhance their work environments. In addition to Inscape, Prevolv represents a number of other best-in-class manufacturers so they can provide their customers with a full turnkey solution. For the past three years, Prevolv has been recognized in Minnesota Business Magazine’s ​“100 Top Companies to Work For” and was also included in The Best and Brightest Companies to Work For® in the Nation in 2017. Prevolv has been providing workplace solutions to CLA since 2007. 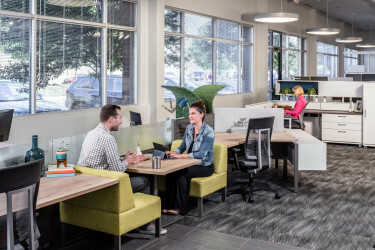 They converted CLA’s isolated and closed work environments to open, efficient, and collaborative working spaces. Inscape’s walls, system workstations, and storage products have been installed in 79 CLA locations across 22 states. Prevolv also provides furniture for private offices, conference rooms, reception areas, break rooms and break out areas. 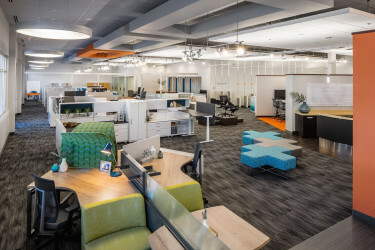 112 benching workstations and 315 LF of Aria glazed storefronts of Inscape products are installed at this innovative health insurance provider. The storefront options include full height sliding & hinged doors with soft close mechanisms on the sliding doors and access card readers. Prevolv also provided ancillary products for their conferencing, break room, reception, and collaborative areas. 2400 LF of Inscape’s Reform movable walls are used in storefront and demising wall applications at Children’s Hospitals and Clinics of Minnesota. Options include occupancy sensors, access card readers, a soft close mechanism for sliding doors, in-panel base electrical and data.